The Look Om Pong Prai Kumarn of Luang Phu Tim, is perhaps the most legendary and famous of all Look Om Pong Prai Kumarn in History, and is the prized possession of the high end collector, and devotee. The Look Om Luang Phu Tim is renowned for its Maha Lap, Metta Maha Niyom Maha Sanaeh anmd Maha Pokasap Power, to increase wealth and bring lucky fortunes and mercy charm, as well as providing immense Klaew Klaad and Kong Grapan Chadtri power to protect. Below we can see a Highly preferred early-Era Look Om Pong Prai Kumarn Pasom Gesa Ta Bronze Wanich Met Klang Niyom (2 Cm diameter medium size ball) – this exhibit is an especially attractive Look Om, highly eligible for entry in competition. This early edition exhibit is rather more highly preferred than the Wat Po Sampant edition of 2517 BE, and of a much earlier edition, with richer Muan Sarn Sacred Powders. The all-time classic Original Wat Laharn Rai Sacred Powder Ball of the Great Luang Phu Tim of Wat Laharn Rai, is one of the most legendary amulets of all time, and one of the most preferred amulets in Thai Buddhist Amulet Collecting. The Muan Sarn Sacred Powders of the Look Om Pong Prai Kumarn Luang Phu Tim Wat Laharn Rai, are one and the same as the powders found in the extremely expensive Pra Khun Phaen Pong Prai Kumarn amulets of this Master. For this reason, are considered a perfect alternative (and more affordable,) to the Pra Khun Phaen Pong Prai Kumarn Luang Phu Tim. The Pong Prai Kumarn powders famously contain Pong Gakoke Dek powdered skull bone of a Hoeng Prai Kumarn. The Look Om came into existence because, after the pressing of Luang Phu Tim’s Pra Khun Phaen Pong Prai Kumarn, Pim Yai, and Pim Lek amulets, there was much of the Muan Sarn Paste which had become too dry for it to be pressed into the finely detailed block press molds of the Pra Khun Phaen amulets. And so this remainder of Pong Prai Kumarn Powder Muan Sarn, was then rolled into wishing ball amulets, as the powders were just too powerful and Sacred to dispense with without making them into amulets. And so it was, that the famous Look Om Pong Prai Kumarn came into existence. The Look Om Pong Prai Kumarn of Luang Phu Tim is considered by most people to be the most famous Look Om Amulet of All Time. 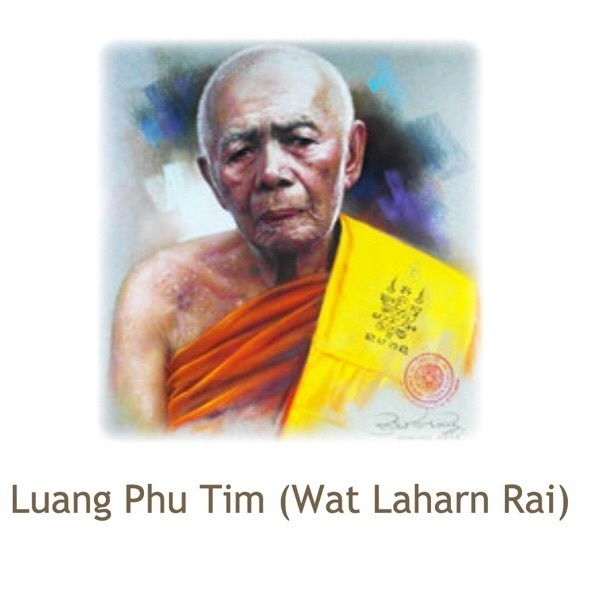 The Original Look Om of Luang Phu Tim Wat Laharn Rai are known to differentiate themselves from other editions released by Luang Phu Tim at other temples. This is for his use of Bronze Wanich golden paint, to cover the Look Om With only in the editions he released through his own temple. Other temple releases of his Look Om (i.e. Wat Po Sampant and others), are of course equally authentic and Sacred, but less preferred than the ones which came through direct release at the temple of Wat Laharn Rai. 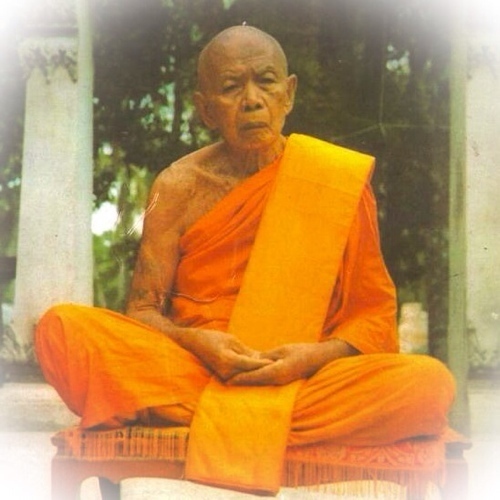 Half the reason being that Luang Phu would use a much more highly concentrated mixture of Pong Prai Kumarn in his own direct releases. 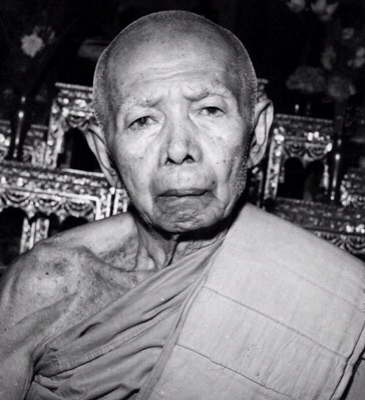 It is hence considered that the Wat Laharn Rai release versions are believed to be much more powerful Maha Lap and Maha Sanaeh type Magic, which are two of the preferred powers with those who like to use Seduction for Love and Business, and Gambling, Lottery and Wealth Attraction. The second reason for the Wat Laharn Rai Niyom versions being the most highly revered and preferred is more of a speculative one, which means they tend to win over other editions in competition, and are considered to have more aesthetic beauty to them for their high presence of Pong Prai Kumarn and the special high quality ‘Bronze Wanich’ golden coating. The Look Om Pong Prai Kumarn Luang Phu Tim amulet, has has been one of the most popular amulets in the whole Pantheon of Thai Buddhist Amulets of the last century, and of all time, and is now almost impossible to encounter commonly anywhere in any amulet emporium, except for the most elite showrooms, and at elevated prices. However, the Look Om is perhaps the most affordable of the Old Classics of Luang Phu Tim when we consider the prices at which his Pra Khun Phaen Pong Prai Kumarn and other master Class Buddha Amulets demand, for which reason, the Look Om Luang Phu Tim is the most highly popular amulet with devotees who do not possess the finances to afford a Pra Khun Phaen Luang Phu Tim, which can cost many thousands of dollars, and even tens of thousands of dollars. The Sacredness is equal to the more expensive Pra Khun Phaen Pong Prai Kumarn, the Muan Sarn Sacred Powders are the same, and in addition, the Bronze Wanich, is also the very same which Luang Phu used to paint the more highly priced Millionaire Amulets of his pantheon, and is one of the recognition factors used to identify his amulets.. This of course makes the Look Om the most affordable way to obtain an authentic study material to train the eyes as to the appearance of the Muan Sarn and Surface textures of his other Classics, to train oneself in recognising the authentic amulet, before risking thousands and tens of thousands of dollars on a Pra Khun Phaen Pong Prai Kumarn Luang Phu Tim. Hence, the Look Om is also a perfect ‘Ongk Kroo’ reference study material for students of the Pantheon, and will increase your chances of spotting an essential rarity at the right price, and without danger of risking a fakery. We highly recommend the Look Om Luang Phu Tim as a sound investment, and a rare chance to obtain and be the proud owner of an authentic Wat Laharn Rai release model of the Eternal Classic Look Om Pong Prai Kumarn Luang Phu Tim. Luang Phu used the Bronze Wanich used in this Look Om, to also paint the famous Nang Paya Plai Diaw, Nang Paya Plai Koo, and the Classic Pra Khun Phaen Pong Prai Kumarn Amulets. This makes it a perfect study piece, a Perfect sacred Amulet for Bucha to receive certain Magical Power, and a perfect showpiece, three excellent reasons all rolled into one (no Pun intended). The making of the Muan Sarn Sacred Powders Look Om Pong Prai Kumarn Luang Phu Tim, came from the Wicha which Luang Phu had inherited through apprenticeship form one of his high Kroo Ba Ajarn, Kroo Ba Sangkh Tao, who was also his true Uncle. Part of the formula included Pong Prai Maha Phuudt, which was made from the Skull of a male Kumarn who died in the Womb, and who died on a Saturday and was cremated on a Tuesday. This is part of the ancient Khmer Necromantic Formula for Authentic Powerful Prai Occult Magic, as practiced in Ancient Times. Despite the fact that the Look Om Pong Prai Kumarn Luang Phu Tim Wat Laharn Rai carried a much lower price than his famous Pra Khun Phaen Pong Prai Kumarn, the power of the amulets is just the same as the Pra Khun Phaen, with the only difference being the lower price. The look om wwere always made using the remaining Muan Sarn Sacred Powders after the limited edition Pra Khun Phaen were all pressed. Any extra Muan Sarn would always be rolled into Look Om, and empowered by Luang Phu Tim in this form. The Look Om is hence the preferred choice of both the wise investor and devotee, as well as the perfect choice for those Devotees who seek the immense power of Luang Phu Tim;s amulets, but cannot afford the price of the Pra Khun Phaen Pong Prai Kumarn Luang Phu Tim. Luang Phu Tim Isarago, is of course not only one of the most highly acclaimed and sought after Guru Monks for his amulets, he is the holder of the highest esteem in Thai Buddhist amulet history for Pong Prai Kumarn powders. 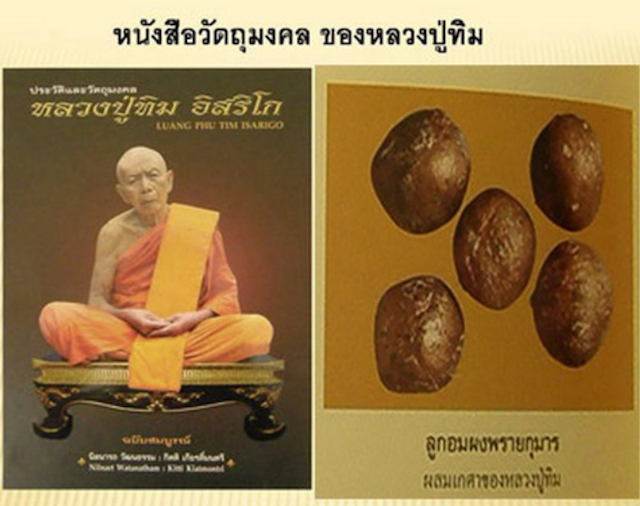 Luang Phu Tim, is Internationally Acclaimed, for his famous Pra Khun Phaen Pong Prai Kumarn, and Look Om powder balls. As to the classic ‘Rian mage amulets which have become all time favourites, and eternally, world famous classic amulets of the high end variety. Below you can see another authentic exhibit (small pim lek) in HD video from a slightly later edition (circa 2517), for comparison of the features and aspects of the Muan Sarn Sacred Powders.